My husband and I love to go to the Conservatory Water early in the morning for coffee and some quiet time in Central Park. This is the Conservatory Water, which is on the East side of the Park just north of 72nd St. We call it the "Toy Boat Pond" because there are privately owned and rented remote control boats sailing the pond. There is a patio with tables, chairs, and umbrellas, and a full Snack Bar and we sit with our coffee while my husband does the NY Times crossword puzzle and I sketch. This morning we even had soft live music from a keyboard and bass. 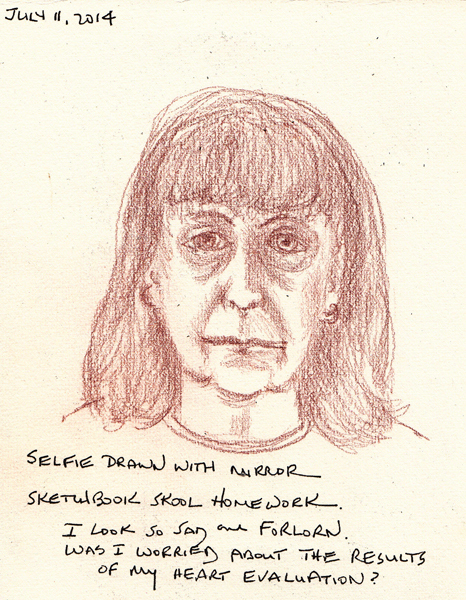 I worked on my homework for Sketchbook Skool - this week Koosje Koene is the teacher and the focus is "Selfies." 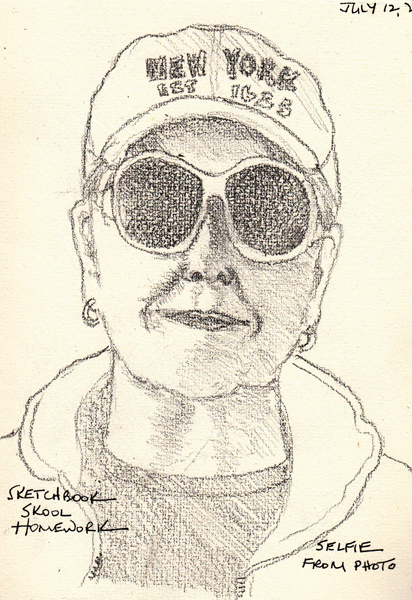 I took a photo from the beach this week and sketched my self-portrait in graphite from the photo. 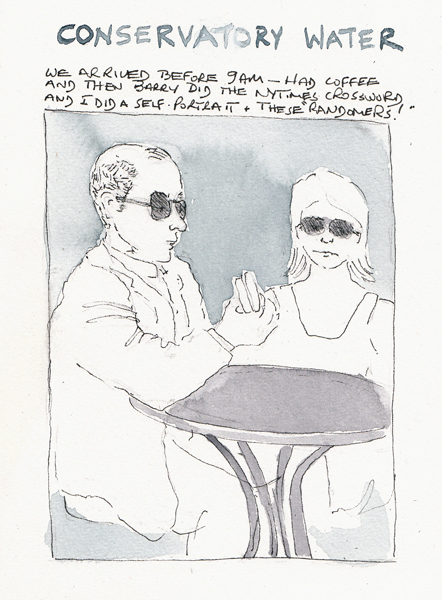 I also did a quick sketch of tourists who were eating at the table next to ours. We finally came back to New York City yesterday, after a wonderful weekend with our family at the beach. The beach was sunny and cool with wonderful breezes and NYC was humid and in the 90s. The first class of Sketchbook Skool Semester 2 was downloaded on July 4th and our whole family was housebound most of the day by torrential rains. This is my homework assignment #2, which Danny Gregory calls "Fast and Slow." You choose a complex object to draw and quickly paint the main shapes. Then you study the object and slowly make a pen drawing - with all of the complexities - over the painted shapes. 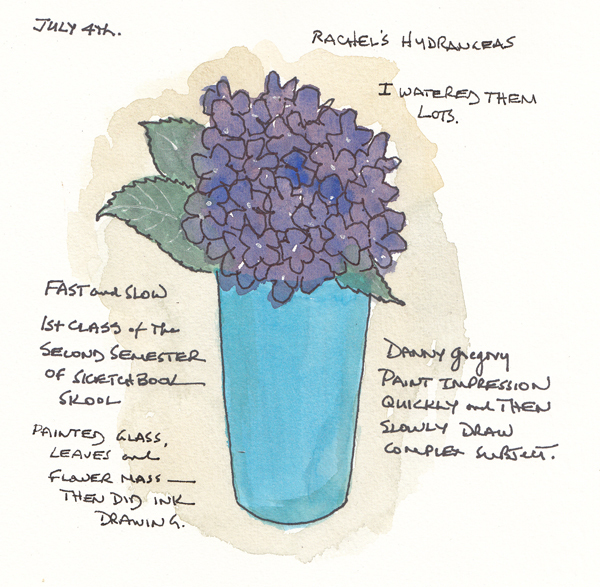 I wanted to paint a hydrangea bloom because they were blooming all around the house, so I quickly painted the cup shape with blue, the leaf shapes with a medium green, and the hydrangea bloom wet-in-wet by first brushing the area with clear water and then dropping in alizarin crimson and ultramarine blue. I was actually pleased with the painting of the big shapes, so when I slowly drew the cup, leaves, and hydrangea petals, I didn't deviate much at all from the painted shapes. I did however need to darken the leaves and add the dots in the center of each petal (Signo white pen). I then painted the background. 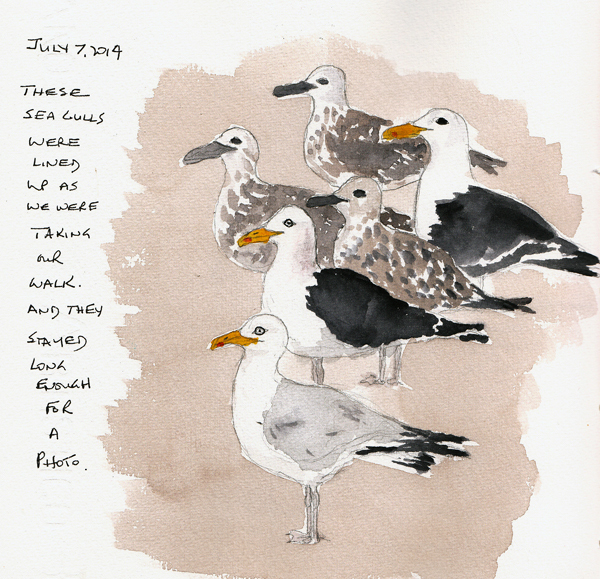 If anyone would like to paint these gulls from a hi-res photo, just leave me a request in the comments and I'll email you a copy. Your email address is automatically seen only by me when you leave a comment, so it will be on its way to you quickly. We are at the beach with our children and grandchildren - except for the 3 who are at sleep-away camp. I spent more time organizing drawing and painting for them than I did working in my own sketchbook. 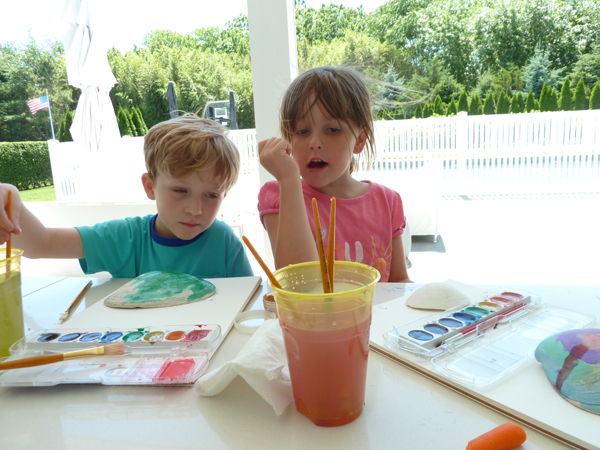 This is Zachary and Annabelle who were painting shells that Annabelle found on the beach with me in the early morning. 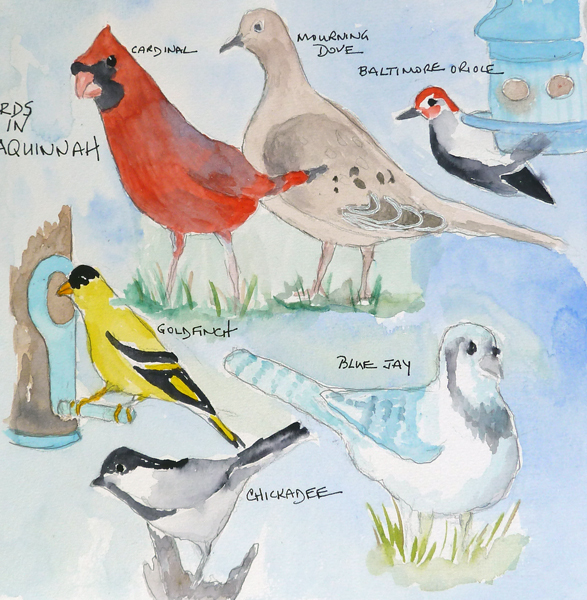 I finished painting the group of birds that we saw at our friends' birdfeeder in Martha's Vineyard at the end of June. And I painted one very long sea gull feather that we found on a beach walk in the mist and fog. We are going home tomorrow and then I need to do some catching up! 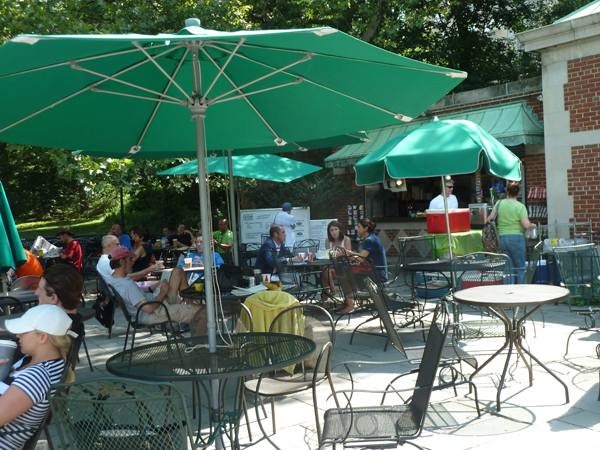 Our Meetup Group met at the Bethesda Fountain and Terrace in Central Park last Saturday. 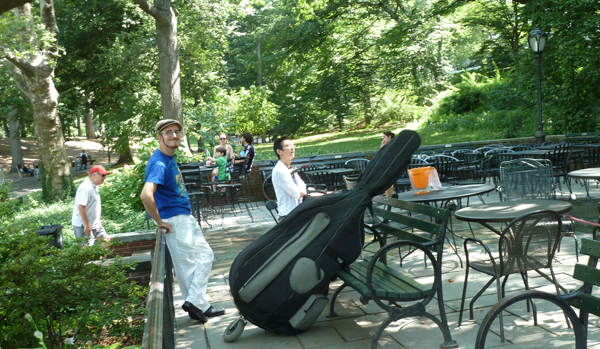 It was sunny and very hot and we all looked for shade during the 3 sketching sessions. 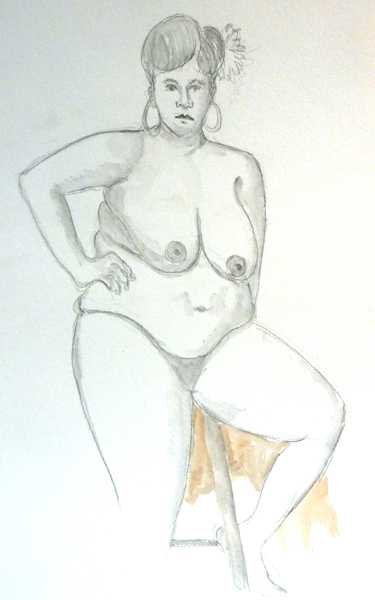 I took one 12 X 18' sheet of watercolor paper so I could make a composite of several drawings. In the end I did two paintings - without linking them. 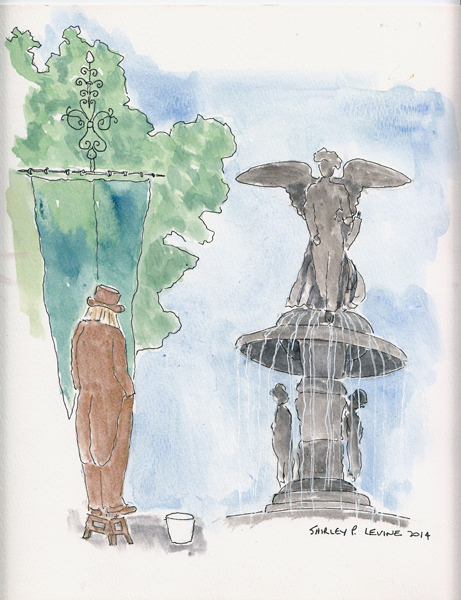 I stood under the arches of the 72nd Street portico and sketched a man dressed in a gold sequin top hat and tails - and then the Angel of the Waters atop the fountain. The man was posing for pictures in exchange for some small donation to his pail. I painted him in bright gold gouache, which can only be seen in the original. For our second 20 minute drawing, I turned around and sketched the arches on the other side of the portico, with the long staircase leading down to Bethesda Terrace from 72nd St. through the Park. It was a bit boring, but my position under the roof was cool. 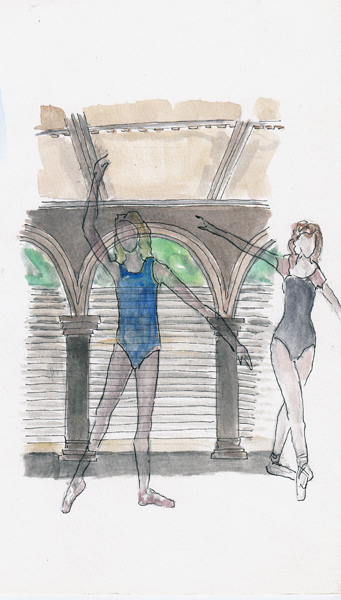 For our 3rd drawing, we walked over to the Band Shell and Mall area, just south of 72nd St. and I was thrilled to see two young ballet dancers posing for photos on the stage. They are teenagers who are in New York City for the American Ballet Theater summer program. When I first saw them they were doing amazing jumps but they eagerly took simple 5 minute poses for me to draw and paint them. They look like ghosts as I painted them over the prior painting. 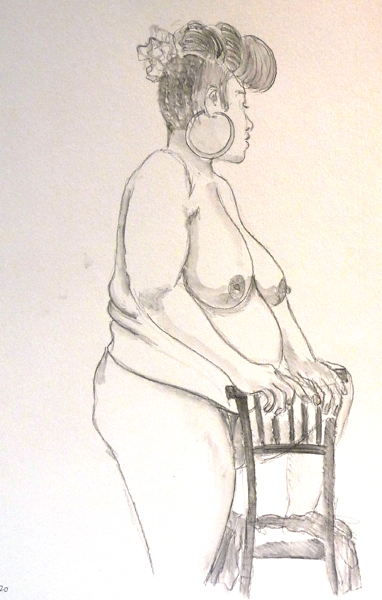 I love the drop-in figure drawing sessions at the Society of Illustrators in New York City. Two models that pose together, wine and snacks, and live music for 3 hours. My classes at Fashion Institute of Technology precluded my usual monthly visit during this past year, but I hope to go each month during the summer. I sketched both of these models previously and was happy to draw them again. My dear friend Sara joins me for a June session each year when she and her husband are visiting us at the beach and then in the City. Here are 3 of my sketches - all done with a washable graphite pencil (Sketch and Wash from General). Each page represents 20 minutes of drawing done on 12 X 18" sheets of watercolor paper.